Hoda Hatoum1, Pablo Maureira2, Scott Lilly1, Lakshmi Prasad Dasi1. 1The Ohio State University, Columbus, OH, USA, 2Centre Hospitalier Universitaire de Nancy, Laxou, France. OBJECTIVE: Bioprosthetic or native aortic scallop intentional laceration to prevent iatrogenic coronary artery obstruction(BASILICA) emerged recently as a solution to potential coronary obstruction. Whether or not this technique enhances washout in the sinus and the neo-sinus has not been investigated yet. 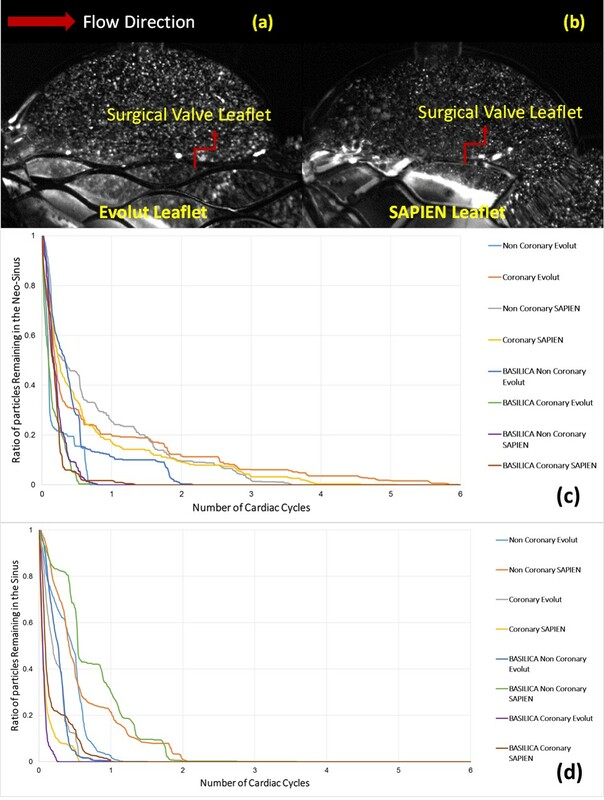 This study aims at evaluating the variations in sinus and neo-sinus hemodynamics with BASILICA post transcatheter aortic valve (TAV)-in-valve (ViV) with and without coronary flow in the context of leaflet thrombosis.METHODS: A 23mm Edwards SAPIEN3 and a 26mm Medtronic Evolut were deployed in a 23mm transparent surgical aortic valve model. The valves were placed in the aortic position of a pulse duplicator flow loop and particle image velocimetry was performed in order to quantify washout (Fig.1a,b).RESULTS: In the absence of coronary flow, neo-sinus washout with BASILICA, was slower with Evolut than without BASILICA (2 versus 0.7cycles). That with SAPIEN3 was 2 cycles faster than without BASILICA. The presence of coronary flow reversed these results to have a quicker washout with Evolut post-BASILICA (0.5 versus 5.5cycles) and with SAPIEN3 (2.5 versus 4cycles). Fig.1d showed that for the sinus as a whole, ultimately without coronary flow, BASILICA showed insignificant difference in total washout for both Evolut (0.5 total cycle difference) and SAPIEN3 (2cycles each). With coronary flow, quicker washout occurred with Evolut and a slower one occurred with SAPIEN3 (0.5cycles each quicker for Evolut and 1 cycle slower for SAPIEN).CONCLUSIONS: BASILICA effect on washout is profoundly pronounced in the neo-sinus rather than the sinus. While no significant differences are found in the sinus, BASILICA led to various neo-sinus washouts depending TAV types, in addition to improved washout in the presence of coronary flow.